IP rated projector enclosures – boost sales for Christmas! ProEnc offer a range of IP rated projector enclosures, especially for the winter season! Many organisations at this time of the year turn their attention to the Christmas and Holiday period and now they are planning how they can maximise their advertising revenue. ProEnc carried out a study with 1 top retailer in the UK and 1 in Florida, they used their IP rated projector enclosure for outdoor advertising their holiday offers throughout November and December 2015 and customers qualified by taking pictures of the projected images on the stores and sharing them on Social Media, this went viral with the help of ProEnc’s app for this. The sales in the US went up 21.3% and in the UK went up 19.1% on the previous year, the retail outlets had to install a projector outdoors and used an existing projector they had in storage, the only expense was the IP rated projector enclosure, as this ensured the projector worked through the more profitable time of the year. ProEnc’s projector enclosures are IP56 or IP65 (Nema 4X), depending on the application and location and are backed by their 25 years’ experience manufacturing protective cases for outdoor electronics. This plus their extended warranty separates them from the competition who are usually new start-up companies with little experience manufacturing steel enclosures, so they cannot offer a secure solution, unlike a ProEnc which is the only enclosure on the market that is fitted with high security locks as standard and are used to replace competitors units in high footfall areas when they fail. If you want to take advantage of their discount use the coupon below, it has been extended to December 2016! And why not watch the video for their IP rated projector enclosure? 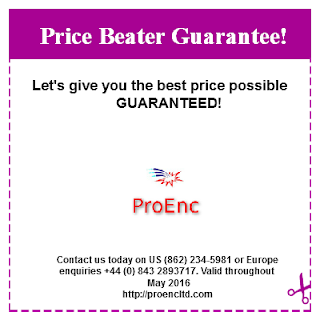 If you want discuss your IP rated projector enclosure requirement or anything related contact us on either the UK number +44 (0) 843 2893717 or the US number (862) 234-5981 or visit http://proencltd.com for US inquiries or for European enquiries visit http://proencprojectorenclosures.co.uk.